The majority of the population in the Raytu District, the drylands of the Bale Region, make a living from animal husbandry. Availability of water is very important. 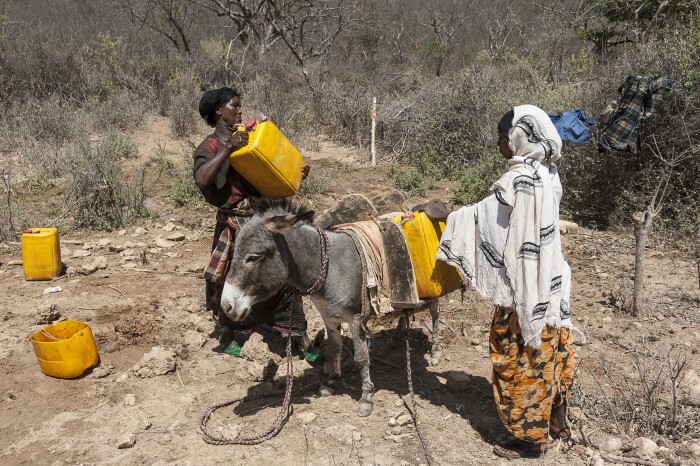 The water reserves are depleting rapidly because very little rain fell during the last rainy season. The basins in which rainwater is collected are emptying very quickly. These basins, dug by the local people, the government, and aid organizations of the EECMY (Ethiopian Evangelical Church Mekane Yesus), are the only sources of water in the area. If they are empty, people have to move elsewhere with their cattle. This is not yet the case in Finco. Last year, the EECMY, together with the local population, dug a large water basin at least three metres deep here. This basin is used by 120 households. There is enough water for household use and for the small livestock. Cows have a different watering hole. Where other, smaller and more shallow basins are already empty or will be so in a month, this basin still has enough water supply to last until the next rainy season.